Importing a Ford Mustang from the United States is the only way to ensure having a wide range of choices, by going directly to the source. Importing American cars like the Mustang has many advantages, starting with the exchange rate, which is markedly favorable to European buyers at the moment. Also, the quality of the vehicles available is very often higher than those available in Europe, if you work with the right contacts. 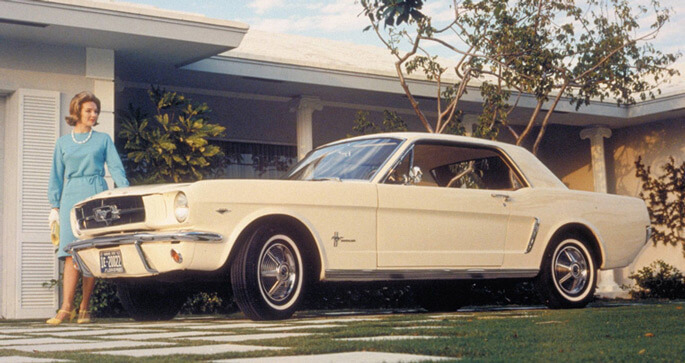 The Ford Mustang is a so-called 'Pony Car' that has been very popular since it first went on sale in 1964. It's no surprise that it is still so popular today, triggering passions and inspiring envy. So you should be careful when looking to acquire this type of car, which could be called "very trendy". Relying on the experience of a Mustang specialist is an essential step to successfully concluding your project to acquire this type of car, under the best possible security conditions and with peace of mind. Whether it is a purchase in France or Europe, or an import from the U.S., it is essential not to minimize the investment to be made. For a few thousand euros, it is certainly possible to acquire a Mustang to restore, while a collector who wants to participate in car shows can spend €40,000 and sometimes €60,000 for models that are exceptionally well maintained, restored, and documented. For a model that arouses some very dynamic deals, you should always keep an eye out, because the offers are so diverse! Many elements contribute to the purchase price of a Ford Mustang. Starting with the overall condition, as well as the idea of originality and conformity. A "Matching" Mustang is one whose VIN on the engine and chassis match, and will have the highest value on the collectible market. Of course, the engine type also plays a big role in calculating the purchase price for a Mustang, with a six cylinder engine being more economical and more financially accessible. The 289ci V-8 in its 2V and 4V versions, fueled by dual or four barrel carburetors and with single or dual exhaust can also affect the price. Body style also has a big influence on price. Starting with the Mustang coupe and convertible version cabriolet or the Mustang Fastback, not to mention the versions improved by the world-renowned Shelby shop in Las Vegas, Nevada. It is still possible to get your hands on so-called "survivor" Ford Mustangs, which means a collectible car that has never been restored, or is still stock. If the car has been properly stored and received strict maintenance, it is not unusual to get an excellent deal. The Ford Mustang turned fifty in 2014. Its popularity continues to climb and it draws new fans every day. Thousands of collectible Mustangs are sold very day. However, its price steadily increases in a straight line, making it a sensible investment. The Mustang's international popularity, even today, makes it worthy of special attention. Many professionals specializing exclusively in this model are still on the scene. There are many websites offering all the parts needed to fully rebuild, restore, or maintain your Mustang. If you have questions before buying your Pony Car, take the time to talk to our specialists. Ten years' experience have enabled us to provide you with expertise and informed advice on the most frequently imported model in Europe!! Keep in mind that the whole Fabulous Motors team will be honored to find and import your Ford Mustang under the best possible conditions. We have developed a vast network of partners over our many trips to the United States. The sellers we work with are specialists in collectible American cars and the Ford Mustang. Our shipping agents can offer their expertise in shipping classic vehicles. Your beautiful American will be transported as if she were a jewel in its setting. We will assist you with each step in the process of importing your Mustang, until it receives its collectible car registration.